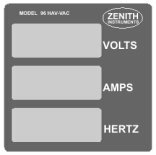 Zenith Instruments manufactures indicators, electronic measurement and control equipment. RMS is a direct measure of the power or heating value of an AC voltage compared to that of DC. An AC signal of 1 volt RMS will produce the same amount of heat in a resistor as a 1 volt DC signal. 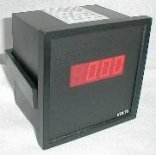 The 96 IND-RMS series are a range of 3 1/2 digit Digital Panel Metersable to indicate from 0 – 1999 amps or volts RMS on a 14mm red LED display. The range can be configured to indicate several options. The 96 HAVVAC is a 3 in 1 0 – 600 VAC indicator, a 0 – 1000 AAC indicator and a 10,0 to 90,0 HZ indicator, all practically mounted in a 96 x 96 panel mount box. NB!! A CT must always be used when measuring current for isolation purposes. The 489 IND is a range of 3 1/2 digit indicators. The amp AC range is capable of measuring up to 5AAC direct or even higher with the use of an external 1A or 5A CT. The 489 RPM Indicator is an Autoranging RPM Indicator which will display the RPM on a 4 digit red LED display. The range automatically changes from 9,999 to 6000 RPM. The 489 HZ series is a 3 digit 14mm red LED frequency indicator capable of reading mains frequency in the range from 30,0 Hz to 70,0 Hz with a signal voltage from 50 VAC to 260 VAC.The unit can also measure from 0 to 999 Hz with a small modification inside.